In bibliography there are several reports on observations of dark waves which rapidly moved through several halos. Several theories have been made concerning the reason for their formation, but due to the few data present these could have never been confirmed. 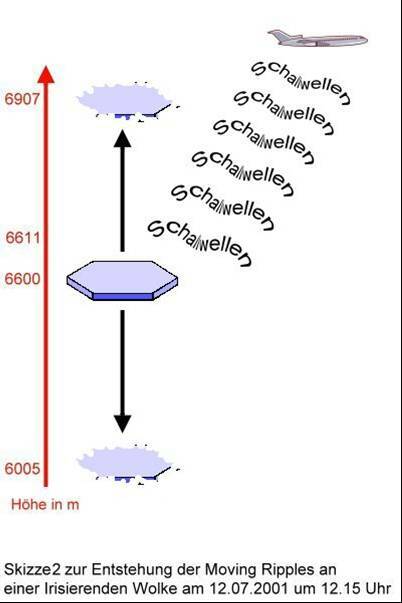 This is the reason why our group (“Fachgruppe Atmosphärische Erscheinungen”) has been gathering observation reports on moving ripples for several years. We just want to penetrate the secret of this unusual phenomenon. Meanwhile we have about 40 observation reports, some of them even with pictures. There is also an observation of my own which I made on July 12, 2O00, when I could observe moving ripples in cloud iridescence, and which renewed my interest in the clarification of moving ripples. So it is high time to interpret the raw material. Meanwhile we have no more doubts that the phenomenon is caused by soundwaves. Nowadays mainly the shockwaves of supersonic airplanes are considered to be the source of them. Often reports told that the observers heard the sound of jet planes before they noticed the phenomenon. It has also been observed more frequently near military airports. Even I watched three jet planes before making my observation of moving ripples. G. H. Archenhold´s speculation that there might be a connection between observations of moving ripples and the sound of larger meteoroids or with the activity of meteor streams, however, could not be confirmed. There is also no reason to believe in this because meteoroids normally do rot reach altitudes of less than 60 km and sound can spread downwards only below this altitude. But there are some cases known from the two world wars where bomb explosions are supposed to be the reason for these soundwaves. Two other observations made in The Netherlands describe thunder as a reason for the phenomenon. If one contemplates halos in which moving ripples have been observed up to now, one comes to the conclusion that they are almost all halos which are caused by horizontally floating plate-shaped ice crystals. In most cases moving ripples have been observed at the 22°-sundogs, at the parhelic circle (13 cases) and at the 120°-parhelia (5). One observation made just this year describes “wave-shaped shadows moving rapidly over the circumzenithal arc“. And also the circumzenithal arc is caused by horizontally floating plate--shaped ice crystals, just 1ike sundogs and parhelic circle. But how does cloud iridescence fit with this theory? If one can believe in general bibliography, are the iridescent colours not caused by small water droplets? As the results of continuous observations of atmospheric phenomena show, 12% of all cloud iridescence is observed in cirrocumulus clouds . A great part of these clouds consists of ice crystals and on1 y a small part of them are freezing water droplets. Even in cirrocumulus iridescence is often observed at a distance of more than 30° away from the sun, which almost excludes light diffraction as a reason for its formation. So, latest theories presume that the colours are caused by interference of rays a part of which passes directly through the cloud layer while the other rays are reflected once or several times inside the layer. So, also there plate-shaped ice crystals are involved. It is obvious that soundwaves mainly make p1ate- shaped ice crystals oscillate vertically and so cause the moving ~ripples. This would also explain the rapid cloud dissipation observed after the passage of the waves through the iridescent. cloud. Our laser-ceilograph (a device for measuring the altitude of clouds) showed an altitude of 6600 m for the corresponding cirrocumulus layer. 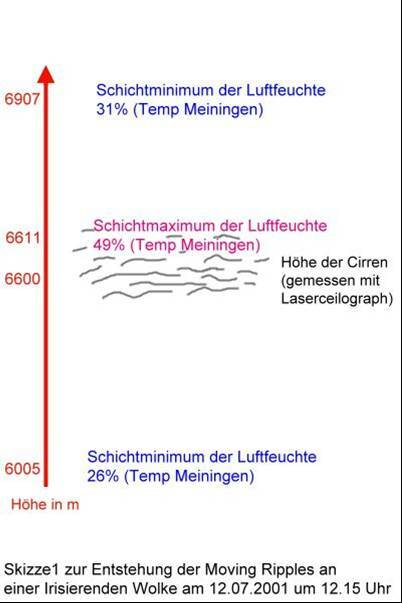 As the temp from Meiningen (18 UTC) shows, a humidity of 49% was registered at an altitude of 6611 m which also was the maximum for the range between 6000 m and 7O00 m. At an altitude of 6005 m the humidity was only 26% and at 6907 m it was 31%. The ice crystals just evaporated in the less humid layers of air where they had been transported to by the oscillations they were exposed to, and so the cloud dissipated within a few seconds. So, the possible reason for those moving shadow bands might be that the plate-shaped ice crystals are made rotating and oscillating by soundwaves, so that a part of the refracted light does not reach the observer´s eyes any more. Also this theory leaves some questions unanswered, for example why moving ripples often appear in several groups of waves or why they have never been observed in colourless cirrus. One reason might be that halos increase the attention of an observer and colours also increase the contrast of the shadows. So, when a jet plane crosses the sky, even if it cannot be heard, one should in any case look out for the phenomenon of the moving ripples.